California Governor Arnold Schwarzenegger is planning to give away billions of dollars in federal money to China. Rather than spend the $2.25 billion in federal economic stimulus money given to California in America, Schwarzenegger wants to give work to Chinese laborers. Instead of having Americans build California’s rail system, Schwarzenegger wants to give it to the Chinese. American’s would not only lose jobs, but US federal stimulus money would be paying for Chinese – not Americans!!! 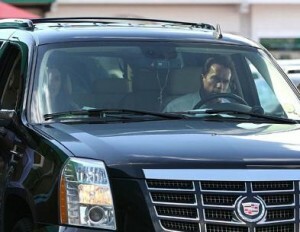 As a millionaire movie-star, Schwarzenegger is out of touch with the plight of American labor. The fact that he is married to super-rich Kennedy heiress, Maria Shriver doesn’t help Schwarzenegger’s vision of reality. The California rail authority plans to build a 465-mile route from San Francisco to Los Angeles and on to Anaheim that is supposed to open in 2020. The authority was awarded $2.25 billion in January in federal economic stimulus money to work on the project. That is only part of the money that Schwarzenegger plans to give to China. The Chinese government has just signed a cooperation agreement with the California High Speed Rail Authority. Schwarzenegger himself is expected to travel Beijing for talks with rail ministry officials to hammer out a deal (including one for himself?). China, naturally, is all too happy to get US federal economic stimulus money – to stimulate China, of course. For the American market, Zheng Jian, of China’s railway ministry said, “we can provide whatever services are needed.” You bet! 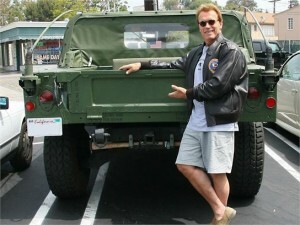 Schwarzenegger’s giveaway comes at a time when we should be doing just the opposite. We should be taking away jobs from foreign workers and giving them back to Americans. Closing the borders to most foreign manufactured goods would do the trick. If we can’t get refrigerators from other countries, we would have to manufacture them in America – giving jobs to American workers. So why don’t we do this? The answer is that the big multinational corporations are against it – it would cost them profits. The big multinational corporations would rather see the American worker unemployed. This way, the wages that would have gone to the American worker would instead be paid to cheap foreign labor, with the profit going to the multinational and its wealthy shareholders. It’s so simple. Close the borders to foreign manufactured goods, and put Americans back to work.